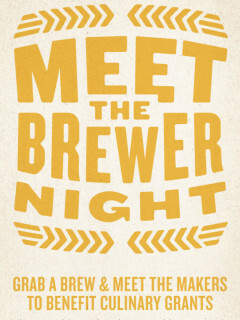 At Meet the Brewer Night, you can, well, meet the brewers (and drink the beer) from Jester King Brewery, Live Oak Brewing Company and Hops and Grain. This is the time to grab a beer, grab a bit from the food that Frank will so graciously provide and listen to tunes from DJ Harrison Fjord all while you chat with the masters behind some of Austin's greatest craft brews. All of the beer and raffle proceeds will go towards Austin Food & Wine Alliances culinary grant program.